Alessandro’s interest in cardiac biology dates back to his undergraduate studies, during which he investigated hypertrophic signaling pathways in Prof. Guido Tarone’s laboratory in Turin, Italy. In order to expand his knowledge to the stem cell and developmental biology fields, Alessandro pursued his PhD studies at the University of Cambridge, where he was generously supported by the British Heart Foundation. 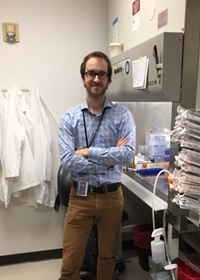 There he worked under the supervision of Prof. Ludovic Vallier to study the mechanisms controlling the early differentiation of human pluripotent stem cells (hPSCs). Having developed skills in chromatin epigenetics, genome engineering, and hPSC differentiation, Alessandro joined the Murry lab in October 2016 to apply these methodologies to the study of cardiac development and disease. When not in the laboratory, Alessandro enjoys either exploring the Pacific Northwest mountains or diving into Seattle’s vibrant city life.